As I boy growing up in Detroit in the 1970s, I loved watching my mother collapse the last of her gargantuan Thanksgiving feast into a few impossibly crammed Tupperware containers and stuff the serving platters, gravy boats, and silver-plate cutlery away for their long sleep through the seasons until the following November. While my father wrestled with the Christmas tree and cursed our cat as it grinned Cheshire-style from the upper branches, my mother would softly sing carols to herself or hum along to the holiday classics on the kitchen radio. My family loved Christmas for many reasons – togetherness, food, faith, and even frantic shopping – but mostly we adored the way it gave rise to an unusual number of opportunities for great stories and copious laughter. 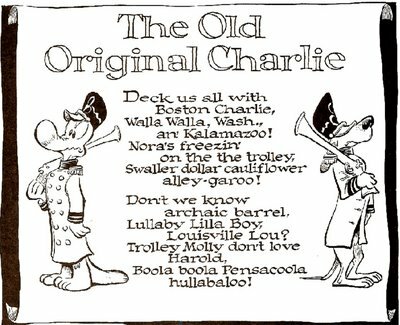 Those post-Thanksgiving radio carols were our first inklings that more manic Christmas cheer would soon come rolling in on an eggnog tsunami of tinsel, gingerbread, Grinches, and Good Old Charlie Brown holiday specials. Every year, though, one particular tune ran a bit askew of the more traditional standards. My mother was hardly a musical person. She could never carry a tune and she famously celebrated the destruction of our family piano, relishing the thought that she had saved her son from the miserable lessons she detested as a child. Yet, she loved Christmas music of all stripes, and one particularly eclectic ditty above all else.